Don’t let the words “Cheap Cars” fool you. Each of these used cars priced under $15k has been tested and inspected to make sure it would surpass even the highest of expectations. If you’re not finding a vehicle that catches your eye, take a look at the rest of our used cars for sale to find a match. When you’re ready, contact us to get your test drive scheduled. KBB.com Brand Image Awards. Delivers 48 Highway MPG and 51 City MPG! This Toyota Prius boasts a Gas/Electric I4 1.8L/110 engine powering this Variable transmission. Washer-linked variable intermittent windshield wipers, Ventilated front & solid rear pwr disc brakes, UV reduction glass windshield. * This Toyota Prius Features the Following Options *Traction control (TRAC), Torsion beam rear suspension, Three-point seatbelts in all seating positions, T135/80D16 compact spare tire, Side-impact door beams, Retained accessory pwr, Rear window electric defogger w/timer, Rear dome light, Pwr windows w/auto up/down, Pwr door locks w/anti-lockout feature. * Stop By Today *You've earned this- stop by LeBrun Toyota located at 2435 Route 332, Canandaigua, NY 14424 to make this car yours today!Get Toyota reliability at a great price. Contact Nicholas Easton with a call/text/facetime at 585-301-0677 or at nicholas@lebruntoyota.com to schedule your test drive today! Interested in more pictures? Want a video of the vehicle? Any further questions? JUST ASK! Your first oil change is free within the next year/15,000 miles. 1 Year/15,000 miles of complimentary roadside assistance for all used vehicles sold from LeBrun Toyota. As always every vehicle we sell retail comes with a 6 month/6,000 mile limited warranty. KBB.com 10 Best Late-Model Used Cars Under $15,000. Delivers 35 Highway MPG and 25 City MPG! This Toyota Camry delivers a Regular Unleaded I-4 2.5 L/152 engine powering this Automatic transmission. CARPET FLOOR MATS & CARPET TRUNK MAT, Window Grid Antenna, Valet Function. *This Toyota Camry Comes Equipped with These Options *Trunk Rear Cargo Access, Strut Rear Suspension w/Coil Springs, Strut Front Suspension w/Coil Springs, Steel Spare Wheel, Sliding Front Center Armrest and Rear Center Armrest, Side Impact Beams, Remote Releases -Inc: Mechanical Cargo Access and Mechanical Fuel, Rear Cupholder, Rear Child Safety Locks, Power Rear Windows. * The Votes are Counted *KBB.com 10 Best Used Family Cars Under $15,000, KBB.com 10 Best Late-Model Used Cars Under $15,000, KBB.com 10 Best Hybrids Under $30,000, KBB.com Best Resale Value Awards. * Stop By Today *You've earned this- stop by LeBrun Toyota located at 2435 Route 332, Canandaigua, NY 14424 to make this car yours today!Get Toyota reliability at a great price. Contact Nicholas Easton with a call/text/facetime at 585-301-0677 or at nicholas@lebruntoyota.com to schedule your test drive today! Interested in more pictures? Want a video of the vehicle? Any further questions? JUST ASK! Your first oil change is free within the next year/15,000 miles. 1 Year/15,000 miles of complimentary roadside assistance for all used vehicles sold from LeBrun Toyota. As always every vehicle we sell retail comes with a 6 month/6,000 mile limited warranty. KBB.com Best Resale Value Awards. Scores 48 Highway MPG and 51 City MPG! This Toyota Prius boasts a Gas/Electric I4 1.8L/110 engine powering this Variable transmission. Washer-linked variable intermittent windshield wipers, Ventilated front & solid rear pwr disc brakes, Traction control (TRAC). * This Toyota Prius Features the Following Options *Torsion beam rear suspension, Tonneau cover w/clasp for under-floor storage, Tilt/telescopic adjustable steering wheel w/Touch Tracer Display -inc: audio controls, HVAC controls, Three-point seatbelts in all seating positions, T135/80D16 compact spare tire, Side-impact door beams, Retained accessory pwr, Rear window electric defogger w/timer, Rear fold-down armrest w/(2) cup holders, Rear dome light. * This Toyota Prius is a Superstar! *KBB.com Top 10 Green Cars, KBB.com Best Resale Value Awards. * Stop By Today *Stop by LeBrun Toyota located at 2435 Route 332, Canandaigua, NY 14424 for a quick visit and a great vehicle!Get Toyota reliability at a great price. Contact Nicholas Easton with a call/text/facetime at 585-301-0677 or at nicholas@lebruntoyota.com to schedule your test drive today! Interested in more pictures? Want a video of the vehicle? Any further questions? JUST ASK! Your first oil change is free within the next year/15,000 miles. 1 Year/15,000 miles of complimentary roadside assistance for all used vehicles sold from LeBrun Toyota. As always every vehicle we sell retail comes with a 6 month/6,000 mile limited warranty. Delivers 29 Highway MPG and 20 City MPG! This Toyota Camry Solara boasts a Gas V6 3.3L/201 engine powering this Automatic transmission. Variable-assist pwr rack & pinion steering, Tilt/telescopic steering wheel w/audio & multi-information display controls, Temporary spare tire. * This Toyota Camry Solara Features the Following Options *Remote keyless entry-inc: 2-stage unlocking, trunk release, panic function, illuminated entry, Rear window defogger, Rear seat LATCH child restraint system, Pwr windows-inc: driver-side auto-up/down, retained pwr, Pwr retractable fabric convertible top-inc: full headliner, glass rear window, auto-down pwr rear quarter windows, Pwr automatic door locks w/anti-lockout feature, Pwr 4-wheel disc brakes, Multi-information display-inc: average speed, instant/average fuel economy, distance to empty, elapsed time functions, LED tail lights, High solar energy-absorbing glass. * Visit Us Today *Treat yourself- stop by LeBrun Toyota located at 2435 Route 332, Canandaigua, NY 14424 to make this car yours today!Get Toyota reliability at a great price. Contact Nicholas Easton with a call/text/facetime at 585-301-0677 or at nicholas@lebruntoyota.com to schedule your test drive today! Interested in more pictures? Want a video of the vehicle? Any further questions? JUST ASK! Your first oil change is free within the next year/15,000 miles. 1 Year/15,000 miles of complimentary roadside assistance for all used vehicles sold from LeBrun Toyota. As always every vehicle we sell retail comes with a 6 month/6,000 mile limited warranty. KBB.com Best Resale Value Awards. Delivers 48 Highway MPG and 51 City MPG! This Toyota Prius delivers a Gas/Electric I4 1.8L/110 engine powering this Variable transmission. 5-PIECE CARPET FLOOR MATS & CARGO MAT, Washer-linked variable intermittent windshield wipers, Ventilated front & solid rear pwr disc brakes. * This Toyota Prius Features the Following Options *UV reduction glass windshield, Traction control (TRAC), Torsion beam rear suspension, Three-point seatbelts in all seating positions, T135/80D16 compact spare tire, Side-impact door beams, Retained accessory pwr, Rear window electric defogger w/timer, Rear dome light, Pwr windows w/auto up/down. 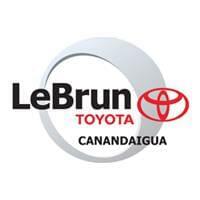 * Visit Us Today *Stop by LeBrun Toyota located at 2435 Route 332, Canandaigua, NY 14424 for a quick visit and a great vehicle!Get Toyota reliability at a great price. Contact Nicholas Easton with a call/text/facetime at 585-301-0677 or at nicholas@lebruntoyota.com to schedule your test drive today! Interested in more pictures? Want a video of the vehicle? Any further questions? JUST ASK! Your first oil change is free within the next year/15,000 miles. 1 Year/15,000 miles of complimentary roadside assistance for all used vehicles sold from LeBrun Toyota. As always every vehicle we sell retail comes with a 6 month/6,000 mile limited warranty. KBB.com 5-Year Cost to Own Awards. This Toyota Corolla boasts a Regular Unleaded I-4 1.8 L/110 engine powering it's polished transmission. CARGO NET, Window Grid Antenna, Urethane Gear Shift Knob. *This Toyota Corolla Comes Equipped with These Options *Trunk Rear Cargo Access, Trip Computer, Torsion Beam Rear Suspension w/Coil Springs, Strut Front Suspension w/Coil Springs, Steel Spare Wheel, Side Impact Beams, Seats w/Cloth Back Material, Remote Releases -Inc: Mechanical Cargo Access and Mechanical Fuel, Rear Cupholder, Rear Child Safety Locks. * The Votes are Counted *KBB.com 10 Tech-Savviest Cars Under $20,000, KBB.com 5-Year Cost to Own Awards, KBB.com Best Resale Value Awards. * Visit Us Today *You've earned this- stop by LeBrun Toyota located at 2435 Route 332, Canandaigua, NY 14424 to make this car yours today!Get Toyota reliability at a great price. Contact Nicholas Easton with a call/text/facetime at 585-301-0677 or at nicholas@lebruntoyota.com to schedule your test drive today! Interested in more pictures? Want a video of the vehicle? Any further questions? JUST ASK! Your first oil change is free within the next year/15,000 miles. 1 Year/15,000 miles of complimentary roadside assistance for all used vehicles sold from LeBrun Toyota. As always every vehicle we sell retail comes with a 6 month/6,000 mile limited warranty. KBB.com Best Buy Awards Finalist. This Toyota Corolla delivers a Regular Unleaded I-4 1.8 L/110 engine powering it's sleek transmission. Urethane Gear Shift Knob, Trunk Rear Cargo Access, Trip Computer. * This Toyota Corolla Features the Following Options *Torsion Beam Rear Suspension w/Coil Springs, Strut Front Suspension w/Coil Springs, Steel Spare Wheel, Side Impact Beams, Seats w/Cloth Back Material, Remote Releases -Inc: Mechanical Cargo Access and Mechanical Fuel, Rear Cupholder, Rear Child Safety Locks, Power Rear Windows, Power Door Locks w/Autolock Feature. * The Votes are Counted *KBB.com Best Buy Awards Finalist, KBB.com 5-Year Cost to Own Awards. * Visit Us Today *Come in for a quick visit at LeBrun Toyota, 2435 Route 332, Canandaigua, NY 14424 to claim your Toyota Corolla!Get Toyota reliability at a great price. Contact Nicholas Easton with a call/text/facetime at 585-301-0677 or at nicholas@lebruntoyota.com to schedule your test drive today! Interested in more pictures? Want a video of the vehicle? Any further questions? JUST ASK! Your first oil change is free within the next year/15,000 miles. 1 Year/15,000 miles of complimentary roadside assistance for all used vehicles sold from LeBrun Toyota. As always every vehicle we sell retail comes with a 6 month/6,000 mile limited warranty. KBB.com 15 Best Family Cars. Boasts 35 Highway MPG and 25 City MPG! This Toyota Camry delivers a Regular Unleaded I-4 2.5 L/152 engine powering this Automatic transmission. Window Grid Antenna, Variable Intermittent Wipers, Valet Function. * This Toyota Camry Features the Following Options *Trunk Rear Cargo Access, Trip Computer, Strut Rear Suspension w/Coil Springs, Strut Front Suspension w/Coil Springs, Steel Spare Wheel, Sliding Front Center Armrest and Rear Center Armrest, Side Impact Beams, Remote Releases -Inc: Mechanical Cargo Access and Mechanical Fuel, Remote Keyless Entry w/Integrated Key Transmitter, 2 Door Curb/Courtesy, Illuminated Entry, Illuminated Ignition Switch and Panic Button, Rear Cupholder. * This Toyota Camry is a Superstar! *KBB.com 15 Best Family Cars, KBB.com 10 Best Sedans Under $25,000. * Stop By Today *Test drive this must-see, must-drive, must-own beauty today at LeBrun Toyota, 2435 Route 332, Canandaigua, NY 14424.Get Toyota reliability at a great price. Contact Nicholas Easton with a call/text/facetime at 585-301-0677 or at nicholas@lebruntoyota.com to schedule your test drive today! Interested in more pictures? Want a video of the vehicle? Any further questions? JUST ASK! Your first oil change is free within the next year/15,000 miles. 1 Year/15,000 miles of complimentary roadside assistance for all used vehicles sold from LeBrun Toyota. As always every vehicle we sell retail comes with a 6 month/6,000 mile limited warranty. IIHS Top Safety Pick. Scores 29 Highway MPG and 22 City MPG! This Toyota RAV4 boasts a Gas I4 2.5L/152 engine powering this Automatic transmission. Washer linked variable intermittent windshield wiper, Traction control (TRAC), Tire pressure warning system. *This Toyota RAV4 Comes Equipped with These Options *Tilt/telescopic steering wheel -inc: audio, display & Bluetooth controls, Side impact door beams, Shift lever w/silver accents, Roof rails, Remote keyless entry, Rear window defogger w/timer, Rear double wishbone coil spring suspension -inc: stabilizer bar, Pwr windows -inc: driver auto up/down, jam protection, Pwr tilt & slide moonroof -inc: sunshade, Pwr door locks. * The Votes are Counted *IIHS Top Safety Pick, KBB.com Brand Image Awards, KBB.com Best Resale Value Awards. * Expert Reviews! *As reported by KBB.com: If a smaller, well-equipped SUV with seating for five and good fuel economy is on your to-buy list, it's hard to ignore the RAV4. Sharp looks, competitive pricing and a strong reliability history further bolster its appeal. Those seeking an all-electric SUV will only find it in the 2013 RAV4 EV. * Stop By Today *Come in for a quick visit at LeBrun Toyota, 2435 Route 332, Canandaigua, NY 14424 to claim your Toyota RAV4!Get Toyota reliability at a great price. Contact Nicholas Easton with a call/text/facetime at 585-301-0677 or at nicholas@lebruntoyota.com to schedule your test drive today! Interested in more pictures? Want a video of the vehicle? Any further questions? JUST ASK! Your first oil change is free within the next year/15,000 miles. 1 Year/15,000 miles of complimentary roadside assistance for all used vehicles sold from LeBrun Toyota. As always every vehicle we sell retail comes with a 6 month/6,000 mile limited warranty. KBB.com 5-Year Cost to Own Awards. This Toyota Corolla delivers a Regular Unleaded I-4 1.8 L/110 engine powering it's polished transmission. Urethane Gear Shift Knob, Trunk Rear Cargo Access, Trip Computer. * This Toyota Corolla Features the Following Options *Torsion Beam Rear Suspension w/Coil Springs, Strut Front Suspension w/Coil Springs, Steel Spare Wheel, Side Impact Beams, Seats w/Cloth Back Material, Remote Releases -Inc: Mechanical Cargo Access and Mechanical Fuel, Rear Cupholder, Rear Child Safety Locks, Power Rear Windows, Power Door Locks w/Autolock Feature. * The Votes are Counted *KBB.com Best Buy Awards Finalist, KBB.com 5-Year Cost to Own Awards. * Stop By Today *Come in for a quick visit at LeBrun Toyota, 2435 Route 332, Canandaigua, NY 14424 to claim your Toyota Corolla!Get Toyota reliability at a great price. Contact Nicholas Easton with a call/text/facetime at 585-301-0677 or at nicholas@lebruntoyota.com to schedule your test drive today! Interested in more pictures? Want a video of the vehicle? Any further questions? JUST ASK! Your first oil change is free within the next year/15,000 miles. 1 Year/15,000 miles of complimentary roadside assistance for all used vehicles sold from LeBrun Toyota. As always every vehicle we sell retail comes with a 6 month/6,000 mile limited warranty. KBB.com Best Buy Awards Finalist. Delivers 37 Highway MPG and 28 City MPG! This Scion iM delivers a Regular Unleaded I-4 1.8 L/110 engine powering this Automatic transmission. Wheels: 17 x 7 Alloy, Wheels w/Machined Accents, Variable Intermittent Wipers. * This Scion iM Features the Following Options *Urethane Gear Shift Knob, Trip Computer, Transmission: Continuously Variable (CVTi-S) -inc: sport sequential Shiftmatic mode, Tires: P225/45R17 All-Season, Tailgate/Rear Door Lock Included w/Power Door Locks, Strut Front Suspension w/Coil Springs, Steel Spare Wheel, Sport Front Bucket Seats -inc: height adjustable driver seat, 6-way driver seat and 4-way front-passenger seat w/integrated headrests, Single Stainless Steel Exhaust w/Chrome Tailpipe Finisher, Side Impact Beams. * Stop By Today *A short visit to LeBrun Toyota located at 2435 Route 332, Canandaigua, NY 14424 can get you a tried-and-true iM today!Get Toyota reliability at a great price. Contact Nicholas Easton with a call/text/facetime at 585-301-0677 or at nicholas@lebruntoyota.com to schedule your test drive today! Interested in more pictures? Want a video of the vehicle? Any further questions? JUST ASK! Your first oil change is free within the next year/15,000 miles. 1 Year/15,000 miles of complimentary roadside assistance for all used vehicles sold from LeBrun Toyota. As always every vehicle we sell retail comes with a 6 month/6,000 mile limited warranty.